Who Should Try Relationship Coaching? Relationship Coaching isn’t just for couples who fuss and fight all the time or those who have dealt with an affair. Coaching is so focused on the future health of the relationship, that it is often very beneficial to go even when the problems in the relationship don’t seem that bad. Anything that is a small problem today has the potential to be a huge problem down the road and Relationship Coaching can address these minor issues in order to figure out healthier ways to cope. 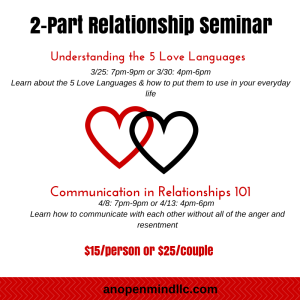 Also, many couples become very complacent with each other as fast as 6 months after meeting and this complacency can lead to resentment in one or both partners due to no longer having the same level of passion and exterior love in the relationship. A lot of individuals don’t have the words to explain to their partners what they’re needing from them, and this lack of appropriate communication is what causes “nagging” and cyclical arguments. A Relationship Coach is able to recognize these needs and help put them into words and move forward in a much healthier, happier way. Because Coaching doesn’t require couples to come every week for months and months, a couple might come 2-3 times and not come back again unless there is another issue that comes up in the future, making it more affordable and convenient than what many expect from traditional couples counseling.